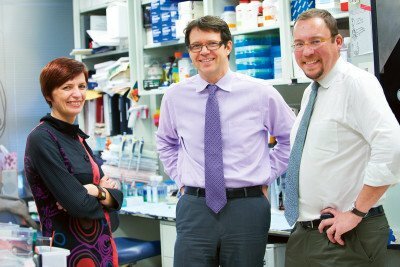 (From left) Investigators Isabelle Rivière, Michel Sadelain, and Renier Brentjens are founders of Juno Therapeutics. Memorial Sloan Kettering’s partnership in a pioneering effort to speed the development of cancer immunotherapies drew national headlines. A pioneering effort to speed the development of novel immunotherapies for cancer drew national headlines this week with the announcement of Memorial Sloan Kettering’s partnership in a newly formed biotechnology company called Juno Therapeutics. Juno is based on groundbreaking discoveries by scientists at Memorial Sloan Kettering, Fred Hutchinson Cancer Center, and the Seattle Children’s Research Institute that make it possible to genetically manipulate immune cells and enhance a person’s natural ability to fight tumors. The approach has already demonstrated potential in treating certain blood cancers such as leukemia. The Seattle startup launched Wednesday with an initial investment of $120 million — one of the largest Series A rounds for a biotechnology startup in history, according to Dow Jones VentureSource. (A Series A round refers to the first significant round of financing for a startup after seed capital.) Hans Bishop, a biotech industry veteran, will lead Juno as CEO. Initial investors include technology venture capital firm ARCH Ventures and the Alaska Permanent Fund through a partnership with Crestline Investors. Juno received attention from a number of media outlets, including the Wall Street Journal, which ran a story emphasizing the collaborative nature of Juno and excitement around early clinical trials at the three centers. To date, approximately two dozen patients across the Juno partner institutions have received treatment with cell-based immunotherapies through clinical trials, and so far the majority of patients are in remission. Juno will focus on the development of targeted immunotherapies like these, which work by unleashing the power of the body’s own immune system to fight cancer – in particular through a type of white blood cell called a T cell. T cells are part of the body’s natural defense system against infection. The technology Juno will pursue involves taking a patient’s own T cells and engineering them to recognize a protein that appears on the surface of cancer cells. The modified T cells are then infused back into the patient’s blood stream so they can launch a precise immunologic attack against the cancer. 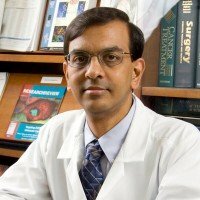 “Based on the unprecedented antitumor activity seen with this T cell engineering technology, we are pursuing an aggressive and comprehensive clinical development plan to accelerate achievement of regulatory requirements and make this therapy available to cancer patients in the shortest period of time possible,” says Memorial Hospital Physician-in-Chief José Baselga. Among the most exciting results is Memorial Sloan Kettering research that reported remissions for the first time ever in patients with an aggressive form of leukemia. These patients typically have a very poor prognosis, often living for only a few months. Drs. 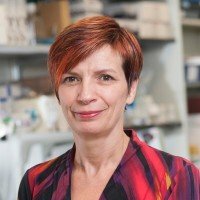 Brentjens, Rivière and Sadelain will present additional findings at the annual meeting of the American Society of Hematology this weekend reporting complete remission in ten of 12 patients with disease that has either returned after or not responded to initial treatment with chemotherapy. Over the past decade, Dr. Sadelain reported several innovations in the design of chimeric antigen receptors, or CARs, leading up to the recent advances in the clinic. CARs are artificial receptors used to engineer T cells and are one of the technologies Juno will explore. Drs. Brentjens, Rivière, and Sadelain, as well as other colleagues in the Center for Cell Engineering, are currently building on the approach in order to expand cell-based immunotherapy to multiple cancers. One such strategy, which allows T cells to recognize two targeted molecules on the surface of cancer cells, could pave the way toward safer, more-effective cell-based immunotherapies and may be applicable in cancers such as prostate. The nonprofit Stand Up To Cancer is currently funding a “Dream Team” led by Dr. Sadelain, in collaboration with Drs. Brentjens and Rivière and thoracic surgeon Prasad Adusumilli, to further investigate the approach in lung cancer and mesothelioma. Additional founders of Juno are Fred Hutchinson President and Director Larry Corey as well as Philip Greenberg, head of Fred Hutchinson’s Immunology Program and Stanley Riddell, a member of its Clinical Research Division; Michael Jensen, Director of the Ben Towne Center for Childhood Cancer Research at Seattle Children’s Research Institute; Richard Klausner, former director of the National Cancer Institute; and Robert Nelson, co-founder and managing director of ARCH Venture Partners. Read the press release about Juno Therapeutics. Is immunotherapy available for small cell lung cancer? I have been a nurse for 40 years. I think this is where cancer therapy is at to preserve the remaining healthy cells. My brother and cousin recently died of lung cancer . My 40 year old nephew was recently diagnosed with small cell stage 3- Is he a candidate? Do you share research therapies with Iowa university Hospital? He is located near central city. Also, the Holden Comprehensive Cancer Center in Iowa City (affiliated with the University) is one of 68 hospitals in the US that is an NCI-designated Cancer Center (a recognition of excellence), so we would suggest contacting them if your nephew is looking for treatment in the area. Hello, please, tell how to start immunotherapy? My sister is ill cancer (sigmoid colon, liver, lungs). Сhemotherapy is unhelpful. We live in St.Petersburg (Russia), but ready to come. Thank you in advance! Are there any treatments for recurrent GBM available or in the pipeline under this work? We are a current mskcc patient. (Not all are currently open but some seem to be recruiting.) Thank you for your comment. Hi J, we do have trials for CLL that are evaluating immune therapies. To find out about participating in a clinical trial at Memorial Sloan-Kettering, you can call our Physician Referral Service at 800-525-2225 or go to http://www.mskcc.org/cancer-care/appointment for more information. Thank you for your comment. What you guys are doing is amazing! Thank you for making this happen. My son may soon be participating in this therapy. First we're going to retry the BITE med he took recently. Is there a name to MSK's in-house group for strategic partnership with start-up companies? a Venture Capitalist arm of MSK? Dear Kaitlin, MSK’s Office of Technology Development may be able to assist you: https://www.mskcc.org/research-advantage/support/office-technology-deve…. It must be amazing to see your work turn into something that can help people. This is inspiring for every student who wants to become a researcher. Specially seeing how big Juno is now. Hard work pays off.